Happy Valentine’s Day! And yes, there is an American Idol perfume. Two, actually. This one’s for women. The one for men–which I can’t seem to find anywhere in a sample size or decant, is called Idol Spirit. In Bottle: Hey citrus, how you doing? This is a pretty normal self-explanatory citrus opener with nothing to feed it any inspiration. I don’t think American Idol perfumes are supposed to be special or unique in any way so I’m not disappointed in the citrus opening–just kind of disinterested. Applied: After citrus, of which I detect mostly clean slightly sweet orange with a bit of bergamot spice. The mid stage is a light white floral consisting mostly of lily and jasmine with a hint of rose lingering here and there. The floral bouquet is done fairly well for what it is. I don’t actually have a whole lot to say except this is decent and wearable though I don’t find anything particularly noteworthy or beautiful about it. It’s light and flowery, not too sweet, and the dry down is inoffensive enough with a fading floral scent. Idol Moments is pretty banal but highly wearable. It’s fresh, it’s clean, the heavy use of florals leans it more towards feminine. It’s dull but it’s not terrible and I can at least commend it for not relying on vanilla to carry the scent. Extra: I expected to hate this but I actually didn’t. I wouldn’t exactly call this competent but I would call it passable. Idol Moments was released in 2004. I don’t really watch the show but their fragrance for women is decent. Design: The bottle is a no frills pink cylinder that kind of reminds me half of Lacoste’s Love of Pink and half of Pink Sugar. Why does everything have to remind me of Pink Sugar? Anyway, if you were looking for beautiful packaging this probably won’t be it as it’s pretty utilitarian and not in an elegant way like Chanel. More like utilitarian in a hairspray can kind of way. The box it comes in is a little silly too with a see through cover where one of the idol figures is standing around in front of the bottle encased within. Notes: Bergamot, mandarin, orange, rose, jasmine, geranium, magnolia, lily, ylang-ylang. Well, that wasn’t too bad. What is bad is tracking this stuff down. You know, some of these gimmick fragrances are a lot harder to track down than some niche and vintage perfumes. If you want a bottle of Idol Moments now your best bet is to hit up eBay. 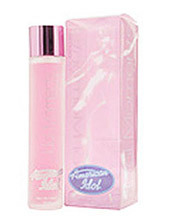 Reviewed in This Post: Idol Moments, 2004, Eau de Toilette. This entry was posted in floral, Reviews By House, spin off and tagged bergamot, geranium, jasmine, lily, mandarin, orange, rose, ylang-ylang. Bookmark the permalink.